Flying out of San Diego? Check your flight status here. NEW YORK -- Nearly 1,510 flights remain delayed or cancelled in the aftermath of a massive weekend blizzard that slammed into the eastern U.S., wreaking havoc on travel in the nation's busiest cities. But that was a big improvement from the 3,100 flights that failed to take off Friday and 4,511 being grounded on Saturday during the height of the storm. On Monday, airports in the New York City and Washington D.C. metro areas were the hardest hit. Newark Liberty International lists 247 cancelled flights and 8 delays as of Monday morning, the most of any U.S. airport, according to the flight tracking service FlightAware. Meanwhile, LaGuardia lists 143 cancelled flights and 3 delays with John F. Kennedy airport listing 43 cancelations and 15 delays. In Washington D.C., Washington Dulles International listed 127 cancellations and 3 delays, making it the third-worst affected airport in the nation. Reagan National had 115 cancellations. Baltimore/Washington International listed 74 cancellations and 4 delayed. The storm had dropped snow from the Gulf Coast to New England, with near-record snowfalls tallied from Washington, D.C. to New York City. The storm dropped snow from the Gulf Coast to New England, with near-record snowfalls tallied from Washington, D.C. to New York City. 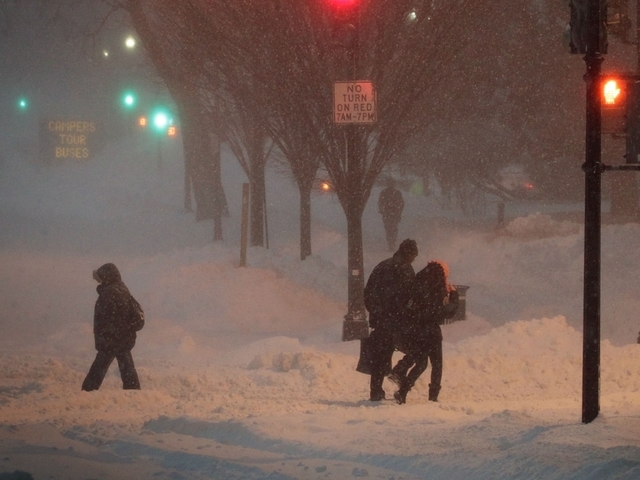 At least 31 people have died as a result of the snowstorm. The deaths occurred in car accidents, from carbon monoxide poisoning, and from heart attacks while shoveling snow.